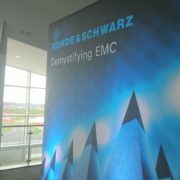 A fantastic day at the Rohde and Schwarz Demystifying EMC 2019 show down at Silverstone. It provided a chance to reconnect with some familiar faces and meet a whole load of new ones. R&S always put on a good event with varied content and lots of interest. I was presenting a talk entitled “From Design To Pre-Compliance: Pitfalls and Pro Tips” which received lots of positive feedback from the attendees. The weather was glorious with bullet blue skies and The Wing venue in the centre of the circuit makes for a great location. 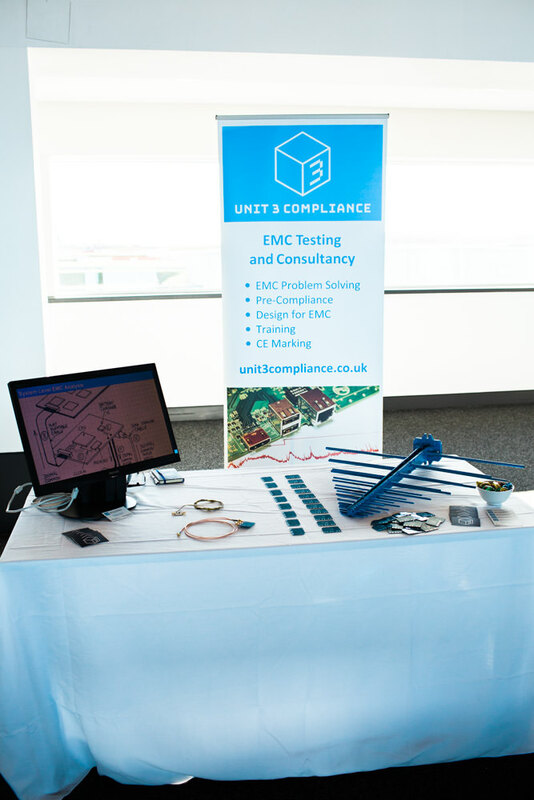 The Unit 3 Compliance stand was very popular throughout the day with a queue of people stopping by to say hello and talk about pre-compliance testing. 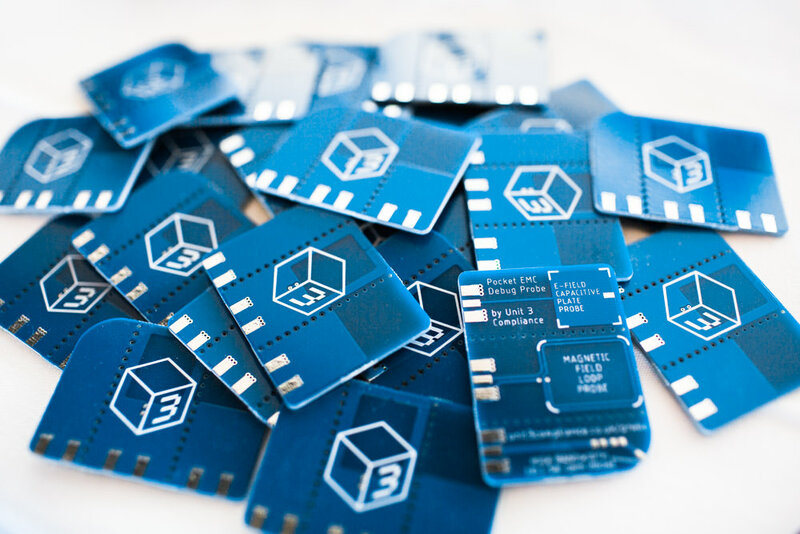 The Pocket EMC Debug Probes flew off the table too. 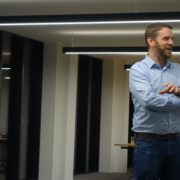 I had the pleasure of speaking at the local IoT Leeds meetup, held at the newly (and finally) renovated “Platform” venue just outside of the train station. 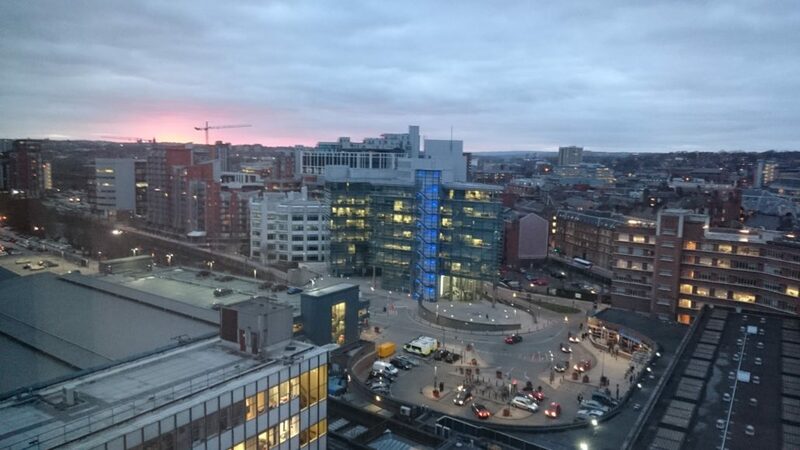 The views over Leeds city centre from our 10th floor suite where the event was being held were impressive. Paul Wealls of Mokanix had the first slot and gave an interesting talk on their development toolkit for mobile applications. I’m not a software engineer (my code makes grown men weep) but the usefulness of this cross network toolkit was evident and seemed to generate a lot of interest among the attendees. Well worth checking out if that’s your bag. 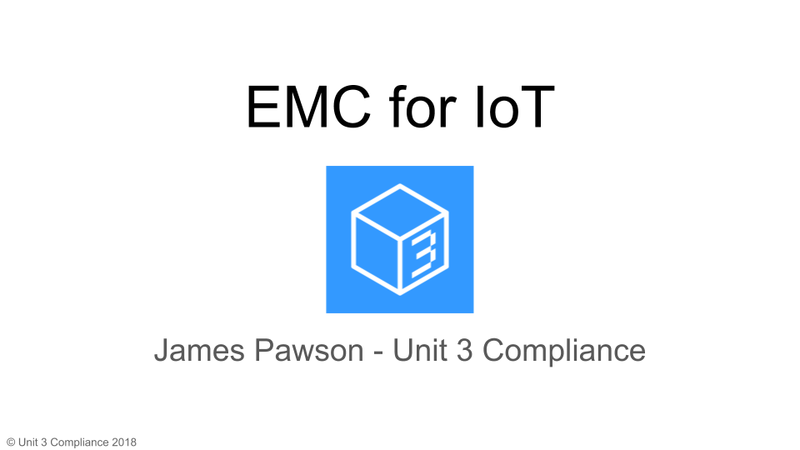 The synopsis of my presentation, titled “EMC for IoT” was a very high level overview of the European EMC and Radio Regulations for IoT hardware, CE marking, and the importance of spectrum protection through compliance. Because I didn’t know the makeup of the audience beforehand it was tricky to know exactly what sort of content to put in. I opted for more graphics than words which gives more flexibility in the subjects covered. In the end, in the audience of around twenty people, there were two (and a half) hardware engineers, mostly software engineers but everyone had a technical background. As such I skewed the presentation towards the general but still went into detail where necessary. I really enjoy speaking on EMC matters and it’s great fun to share knowledge with like-minded interested professionals. The questions received after the presentation were all very intelligent and well thought out. 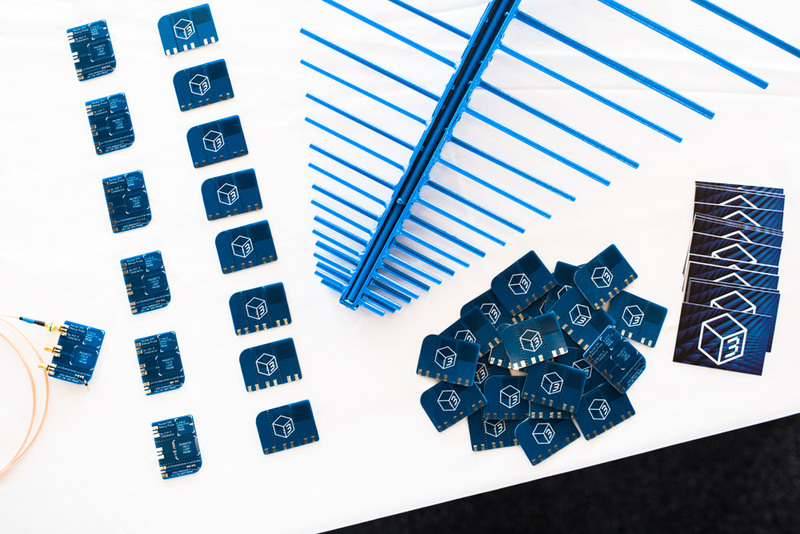 They ranged from instances of counterfeit components causing EMC problems, understanding risk, the costs involved and the use of mobile devices on aircraft. Despite what can be seen as a dry subject the feedback from the presentation was very good. It was also great to see my ex colleague Chris who I hadn’t seen for a long time and catch up with him. We both headed to the Leeds Brewery Tap for a pint of Midnight Bell with Will (organiser) and Neil and for a chat that ranged from the local job market to AI before hopping on the train home. All in all, a good evening! I’m looking to take the talk out on the road for other meetups or organisations so if you know anyone running an technical event where this would fit in then I’d be interested to hear about it. 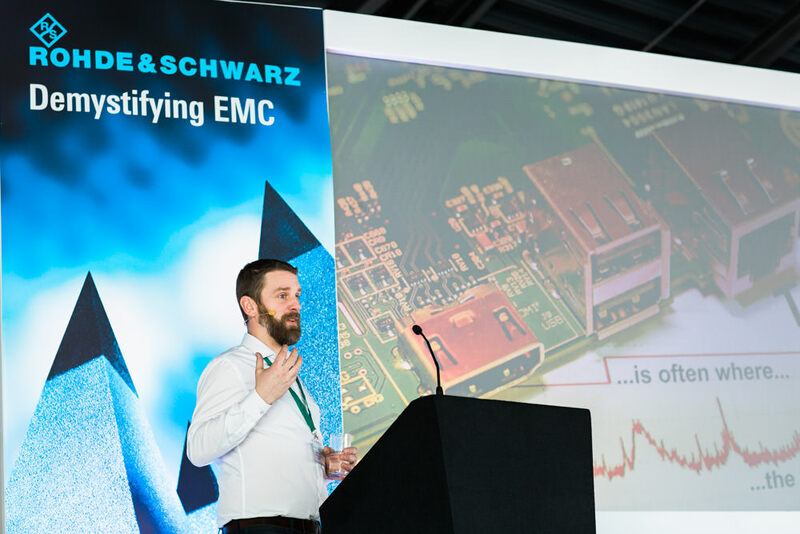 Rohde & Schwarz held this years’s instance of their excellent Demystifying EMC seminar at the Silverstone race track in the Midlands. The venue was right in the middle of the racecourse with a great view of the start/finish straight. 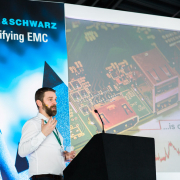 It was good to see so many meaty sounding technical EMC presentations on offer and my only regret was that I couldn’t split myself into two or three and attend them all. Instead, I’m going to have to wait patiently for the PDFs of the slides to come through. In the meantime here’s a quick rundown of some salient points from the presentations that I attended. Given the relatively short amount of time, Lee gave a very condensed presentation of basic EMI issues encountered, the need for probing and the merits of different types of probes available. The only small disagreement I’d have with his otherwise excellent talk was his recommendation against making one’s own near field probes. I think that, with some consideration and research, it is possible to make probe sets that are just as useful as ones you can buy. I frequently use a home made capacitive field probe for debugging and actually prefer it to the one from my purchased kit. However, having the luxury of an anechoic chamber, I’m usually using the probes to chase a known frequency. Therefore I’m more interested in relative sensitivity rather than absolute calibration as I’ll already have some comparable absolute levels from the chamber. If you get the chance to see Lee present I can highly recommend attending. Stuart gave a brief run down of the Technical File requirements and I was pleased to find out my understanding of the requirements was aligned with his. The EMCD and RED come with a requirement for manufacturers to complete a Risk Assessment and James gave a thought provoking presentation on how one might go about this. Interestingly in future harmonised product standards, the Annex ZA/ZZ part will give information on what Essential Requirements of the directives that the standard gives a presumption of conformity to. This will take a while to filter into the mainstream, especially given the sometimes glacial pace of standards publishing and vested interests within standards committees. Again, it all hinges on how comfortable a particular manufacturer is with the concept of risk. Sometimes, as EMC and standards professionals we often apply things rigorously when such an approach might not be required from the manufacturers standpoint. This is an issue I’ll be coming back to in a future blog as its something that most people probably don’t already formally complete or even consider. I shall be advising my customers on how to best complete these requirements in the future. Michael gave a thorough and practised presentation into the requirements for integrating radio modules into existing products, from the perspective of the FCC and the RED. I was pleased to find out his talk confirming my understanding of the process. Real time spectral analysis for EMI debugging. I miss the real time analyser from my previous employer when I could prise it out of the hands of the RF department. I’ve had some success with replicating this using a low cost pre-amplifier and Software Defined Radio (SDR) but its not a patch on a proper instrument. The usefulness of a large real time bandwidth and good user interface is not to be underestimated and I’ve found several intra-system (platform noise) based problems using this technique. Langer presented a really good look at the physical basis for radiated emissions from PCBs. I’ll be studying these slides for future ideas into debugging emissions! They also had a demo in the exhibition hall of their miniature noise injection pens which I’d be very interested to trial in future. Wurth have some dense and interesting looking info on filtering for DC/DC converters. The broadband noise from these can be quite pernicious and often ends up making its way out of poorly filtered unscreened power cables. Albatross Projects gave an update from the CISPR committees responsible for various product standards. Points of interest were EN 55035 making onto the RED list of standards and some small changes to test equipment for EN 55015. Rohde & Schwarz had a good primer on requirements for the Radio Equipment directive from the radio testing perspective. Given the vast range of radio test equipment they make it was no surprise that this featured and who can blame them! Michael Derby (ACB) also had some slides on the RED and the state of various ETSI standards. There was a wealth of info in this presentation so I shall be going through it in some detail. All in all I was most impressed with the technical content at the seminar and will certainly be attending future events. Thanks to the Rohde & Schwarz for putting on such a good event. 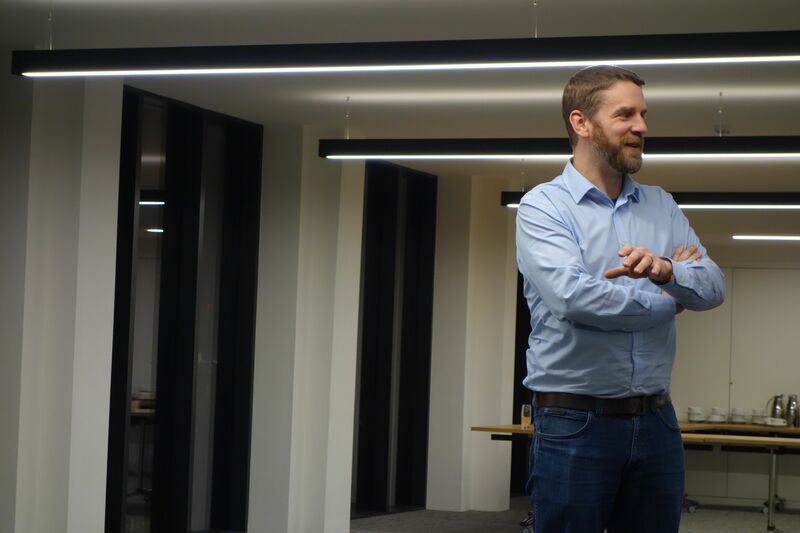 I attended a really interesting technical conference on IoT security yesterday at the Digital Exchange right here in Bradford (organised by Future Electronics). The main message I took away was that IoT security is achievable but requires a lot of thought up front at the design stage including selection of the primary hardware to enable secure identification of the IoT node. 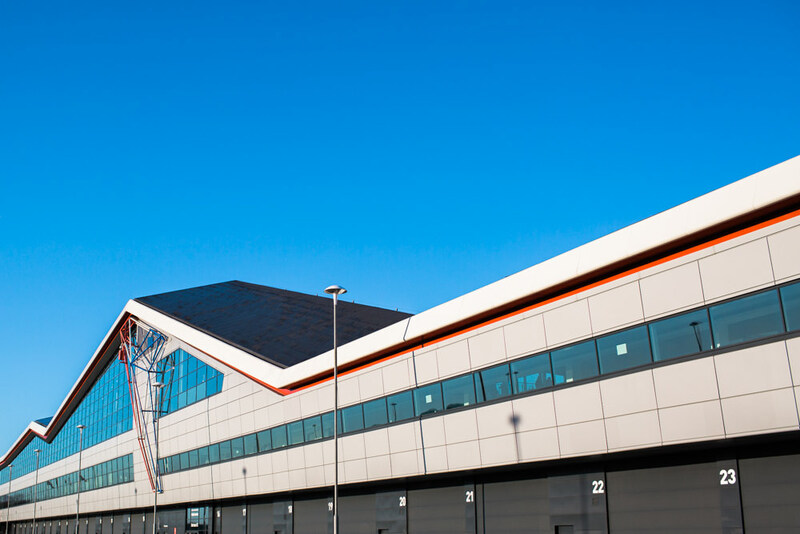 Obviously the level security should be aligned with the value of the asset being secured and that is down to the security risk assessment performed (or not!) by the manufacturer. First we enjoyed a superb talk by Ken Munro from Pen Test Partners on ethical hacking of IoT devices and how compromised security of one device can lead to a whole heap of problems. Examples included a large DDos botnet made from compromised CCTV DVRs, plain text passwords stored in a Wi-Fi kettle and hacked building management systems being used to mine Bitcoins. Following on from that, there were some good presentations from NXP Semiconductors on their A1006 devices and smartcard based signing ecosystem, ST Microelectronics on their ST32 microcontroller security and ST Safe modules, and lastly Arm on their mbed OS and mbed cloud security features. Overall it was a well organised event; the Digital Exchange building on Peckover Street has been well converted into a conference and working space. It was nice to meet some new faces as well as catch up with old ones. My only regret is that I couldn’t stay for the fine Bradford curry afterwards as I had a train to catch.